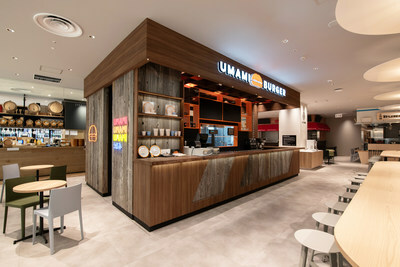 NEW YORK, March 18, 2019 /PRNewswire/ -- Umami Burger, sbe's world-renowned premium burger brand, is thrilled to announce the opening of its third location in Tokyo at Kinshicho Parco Sumida Food Court, one of the largest and biggest department stores in Tokyo on Saturday, March 16 and unveil a fourth location in the trendy district of Ebisu at Ebisu Mitsukoshi Basement Food Court on March 27th. These locations are in partnership with Japanese-based Medeiros Holdings Co., Ltd. and are Umami Burger's first QSR concepts for the brand in Japan. Sam Nazarian, Founder & CEO of sbe, states: "We are thrilled to introduce Umami Burger's first QSR concept with the opening of our third and fourth location in Japan. Following the success of our first two locations, we are proud to continue our international expansion and bring the best hospitality experience to our guests. I want to thank Mr. Kaiho, our Japanese partner, and his team for their incredible passion and execution as we look forward to further growing the brand in Japan." Tatsuhiro Kaiho, CEO of Umami Burger Japan, states, "We are extremely excited for our next two restaurant openings in Japan and to continue to grow the Umami Burger brand. Working with Sam Nazarian and his team has been wonderful and we are looking forward to future expansion." The Kinshicho Parco location will emulate the same bold aesthetic as the two existing locations designed with natural wood, leather, and pops of color to give it that "Umami" flavor. The Kinshicho Parco menu will offer guests a variety of Umami Burger's iconic dishes including the Manly Burger, the mouthwatering Truffle Burger along with a Teriyaki Samurai sandwich and flavorful Boba Shakes to indulge in. The first location in Japan opened in March of 2017 in a neighborhood outside of Tokyo called Aoyama with a second location opening just this past September in Minatomirai. This announcement comes on the heels of Umami Burger's latest Artist Series collaboration with award-winning Butcher Dario Cecchini and AccorHotels commitment to open over one hundred Umami Burger restaurants across the globe in the next seven years in partnership with sbe. Umami Burger Kinshicho Parco is located at Kinshicho Parco 1st Floor, Sumida Food Court, 4-27-14 Kotobashi, Sumida-ku, Tokyo, Japan 130-8535 (Tel: +81 3 5669 0074) and is open daily from 10:00am to 11:00pm. For more information on Umami Burger visit umamiburger.com or follow @umamiburger or #umamiburger on Facebook, Twitter, and Instagram. Founded in Los Angeles in 2009, Umami Burger has been named GQ's "Burger of the Year," Men's Journal's "Best Burger in America" and one of the "25 Most Innovative Consumer Brands of 2016" by Forbes' CircleUp25. Currently, Umami Burger has 18 restaurants in California, New York, Illinois, Nevada, and Japan with additional locations planned around the world. sbe, the leading lifestyle hospitality company that develops, manages and operates award-winning hospitality venues, is Umami Burger's majority shareholder. For more information on Umami Burger, please visit umamiburger.com or follow @umamiburger or #umamiburger on Facebook, Twitter, and Instagram.